The Bi-City Biennale of Urbanism\Architecture (UABB) is to be held in Shenzhen, China, for its 7th edition on December 15th, 2017. Asia’s leading annual design event wrapped up its 11th edition with a final day of seminars at the Hong Kong Convention & Exhibition Centre. With Belgium as the year’s partner country, the event has been a major success and the third day of the BODW forum closed the conference in style. 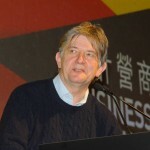 ”The most important thing for city design is to know its culture well.” With that, the West Kowloon Cultural District Association’s CEO Michael Lynch opened the third day of the Business of Design Week 2013. The morning saw two excellent sessions for delegates. ‘Culture & The City’ (Part 1) expounded on the role of design in society with urbanist Charles Landry, an international authority on imaginative urban change, and founder of Comedia, a network of experts who focus on creativity, culture and urban changes. Belgian architect Hilde Daem related her works to a wider cultural context of science and the arts, stating “We make conversations with the world, the people and the music.” Deyan Sudjic presented a sensational discussion on his career in journalism, academia and as the director of the Design Museum in London. 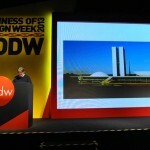 Daan Roosegaarde had the audience mesmerized by his speech that explored his range of high tech designs and projects. In the other morning session ‘Product & Design, Australia-born, Belgium-trained Danny Venlet attracted great interest with his contemporary style in interior projects like the Burdekin Hotel in Sydney and Q-bars, an Australian chain of nightclubs. 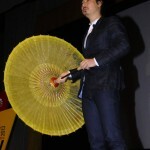 Zhang Lei, the lone Chinese member of the design trio PINWU, lectured on his ecologically inspired work in contemporary furniture and objects using traditional techniques and materials such as bamboo, porcelain, water silk floss and paper. Belgium native Pierre Leclercq talked about the high-octane auto industry in China as the Vice President and head of design Great Wall Motors. Tomek Rygalik and Gosia Rygalik of Studio Rygalik offered great insight on the relationship between food and design in their furniture, products and interior spaces, saying they hope their food design can gather creative people with tasty food and interaction. Rounding up the session was Alain Gilles whose fascinating personal approach to product and furniture design, art direction and interior architecture, has won him a number of international awards, including the coveted Red Dot Award. The conference closed with the afternoon session of ‘Culture & The City’ (Part 2) featuring Lars Nittve, executive director of M+, museum for visual culture of the West Kowloon Cultural District in Hong Kong whose highlighted its development. Other speakers were Colin Fournier, co-architect of the Kunsthaus Graz in Austria and partner in architectural, design and consulting firm TETRA. Christine Conix, manager of CONIX RDBM Architects, articulated her philosophy on adjusting to open spaces to create identity and enduring value. Wim Pijbes, general director of the Netherlands’ Rijksmuseum Amsterdam home to one of the world’s most celebrated art collection, enthusiastically detailed the reopening of the museum this year after a 10-year, US$489 million refurbishment . Wrapping up the event was Ascan Mergenthaler, senior partner at Herzog & de Meuron. Mergenthaler is known for his high-profile international projects such as The Tate Modern in London. He said he is excited about his work on the Central Police Station, the new development to conserve and revitalise the historical site in Hong Kong. 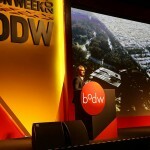 It was also announced with much excitement that the partner country for BODW 2014 will be Sweden. 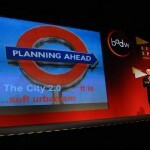 BODW culminated with the HKDC Annual Awards Gala Dinner in the evening. 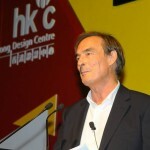 Organised by HKDC, the awards are dedicated to design, innovation and brands. It is a major platform to celebrate design excellence with the Design Leadership Award, World’s Outstanding Chinese Designer Award, and the Lifetime Achievement Award. Close to 1,000 guests attended the event including business leaders, design masters, professionals and friends of HKDC from Hong Kong and abroad. 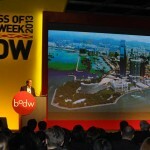 The Hong Kong Design Centre has been the organizer of Business of Design Week (BODW) since 2002. The annual international event is aimed at promoting design and strengthening ties between the design and business communities. 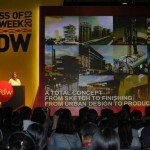 Each year, BODW attracts design and business elite from around the world to Hong Kong. The world’s attention is drawn to current design issues through various exhibitions, international forums and outreach activities tailored to provide designers, business leaders, educators, SMEs and the public with communication opportunities to build strong business and commercial development. It is a world-class platform for the exchange of ideas, and an internationally renowned annual design event. (November 11, 2013) To host a significant portion of the exhibitions of the 2013 Shenzhen Biennale, UABB(SZ) [Bi-City Biennale of UrbanismArchitecture(Shenzhen)] has reclaimed an abandoned old warehouse at the Shekou Ferry Terminal. Built in 1981, the Shekou Ferry Terminal is the gateway of ferry service in Shenzhen. The warehouse facility, however, has been vacant since more convenient rail lines finished construction and other functions like customs declaration transferred to other regions. For the UrbanismArchitecture Biennale, Curators, Academic Directors Li Xiangning and Jeffrey Johnson have adopted the space for exhibitions. The warehouse will be transformed to host the exhibition opening on December 6th and later serve a general role in the Shenzhen cultural landscape. The post-industrial site at a transport terminal is perfect for their curatorial “documentary” on the theme of ‘Crossing Urban Boundaries’. The five-part exhibition, in the words of Li and Johnson, examines multiple historical readings of “cities”. They seek to document critical themes pertaining to urban borders. Their exhibition will include an analysis of the historical evolution of borders, and an exploration of theoretical interpretations by contemporary practitioners. In the ‘Border Timeline Documentary’ section, 15 architects from 15 different global cities will contribute individual city case studies. Each participant will produce a succinct essay and supplementary images examining past, present and future urban “border” conditions. World renowned architects and designers will offer their vision for urban boundaries in the section entitled ‘Crossing Border Case Studies.’ Highlights include German architect Juergen Mayer’s examination of the use of silhouettes as border and landscape in “border.scape” and the recent editor of Domus Italy, Joseph Grima, in collaboration with Tamar Shafrir, will be looking at the short-lived commercial sea platform Isolla della rose off Rimini. Other architects participating in the study include Ma Yansong, one of the most talented young Chinese architects, and Teddy Cruz, known for his work on housing and urban policy, who will be presenting “Political Ecuador” – an installation on the topic of the San Diego – Tijuana border. A more psychological and cultural paradigm is explored in the ‘Exploring the Social Boundary’ section. Of special note is Professor Lou Yongqi, a sustainability proponent who investigates the issue in his display, Designing the Urban-Rural Interaction. The two other sections of the exhibition are ‘National and Regional Pavilions’ as various countries showcase their talents, and the ‘Border Video Gallery’ which will feature five movies and four videos by artists. The other main venue for Shenzhen’s UABB(SZ) 2013 is the former Guangdong Float Glass Factory. Promoting innovation in the disciplines of architecture and urban planning, the UABB not only seeks to bring academic accomplishment into the spotlight but to look beyond current global trends and towards the future, all the while promoting the synergy of Western and Chinese innovative architectural ideas. Bi-City Biennale of Urbanism/Architecture (UABB) is currently the only biennial exhibition in the world to be based exclusively on the set themes of URBANISM AND URBANIZATION. Co-organized by the two neighboring and closely interacting cities of Shenzhen and Hong Kong, UABB situates itself within the regional context of the rapidly urbanizing Pearl River Delta, concerns itself with globally common urban issues, extensively communicates and interacts with the wider public, is presented using expressions of contemporary visual culture, and engages international, avant-garde dimensions as well as discourses of public interest. October 2013 – A major attraction of the 2013 Shenzhen Biennale, UABB (Bi-City Biennale of Urbanism /Architecture), is the creative and dramatic transformation of an old Shenzhen glass factory into one of the Biennale’s core venues for this year. Spearheaded by Ole Bouman, the UABB’s curator and creative director, the project adhered to his manifesto statement of “Biennale as risk.” The revitalisation effort not only provides a unique and functional exhibition space for the Biennale but it reclaims a piece of heritage and history. As a broader objective, the makeover is also a step in redefining Shenzhen’s identity. In completing the urban intervention, Mr. Bouman now calls it a ‘Value Factory’ to manufacture ideas and knowledge. Built in 1986, the former Guangdong Float Glass Factory had been derelict since 2009. The metamorphosis began in May as an international collaboration effort. At Mr. Bouman’s invitation, architectural and design firms from as far as India, Brazil and the Netherlands worked with Chinese design partners in a “Matchmaking Workshop” as different design teams paired off to execute their collaboration on various parts of the factory – from the entrance, storage facilities, the main hall and various silos. The transformation process was completed in only three months. The revamped glass factory will not only be an exhibition showcase for the biennale’s three months, but it aims to serve as a facility for nurturing, and a source of, inspiration for the city hopefully for years to come. Already, the ‘Value Factory’ appears to be achieving its goals, by developing strong alliances with partners both local, regional and from all over the world. Among them include globally renowned cultural institutions like Victoria & Albert Museum (V&A), MAXXI, OMA, Droog Design, International Architecture Biennale of São Paulo, MIT, MoMA New York, and the Berlage. As a venue for the Shenzhen’s UABB 2013, the old Guangdong Float Glass Factory, along with the other exhibition site the Shekou Ferry Terminal old warehouse, has elevated it from just design and architecture installations to a significant cultural and social event relevant to urban sustainability and regular citizens. As Mr. Bouman declares in his manifesto, “(the biennale) is a vehicle for change, for real change. It produces leverage for alternative histories and a new future.” In short, the former glass turned ‘Value’ factory will strive to create value by preserving it. It is the 5th edition of the Bi-City Biennale of UrbanismArchitecture (UABB): the only biennial exhibition in the world to be based exclusively on the themes of urbanism and urbanization and is co-organized by Shenzhen and Hong Kong. Bi-City Biennale of UrbanismArchitecture (UABB) is currently the only biennial exhibition in the world to be based exclusively on the set themes of URBANISM AND URBANIZATION. Co-organized by the two neighbouring and closely interacting cities of Shenzhen and Hong Kong, UABB situates itself within the regional context of the rapidly urbanizing Pearl River Delta, and focuses on globally common urban issues. It extensively communicates and interacts with the wider public and is presented using expressions of contemporary international visual culture. From December 6th 2013 to February 28th 2014, the Shenzhen & Hong Kong Bi-city Biennale of UrbanismArchitecture (UABB2013) will host a series of exhibitions merging architectural, socio-cultural, and artistic visions with the Pearl River Delta between the two cities. Two teams of curators and designers will revamp the two major venues – an abandoned Float Glass factory and a run-down factory near the ferry terminal – to address urbanization themes concerning Shenzhen and Hong Kong. UABB2013 is the most globalized event of its kind, aiming at bringing future global trends to both industry professionals and the greater public through combining the synergy of Western and Chinese architectural concepts. The curatorial team, led by Li Xiangning and Jeffrey Johnson, will create a six-part exhibition in a run-down factory near the Shekou Ferry Terminal, which, later on, will host national and regional pavilions from the United Kingdom, Spain, Belgium, USA, Canada, Mexico, Sweden, Italy, and Macau. Internationally renowned designer Ole Bouman and his team will be offering another viewpoint of an abandoned Float Glass factory through the theme “Biennale as risk”: giving a new purpose to industrial heritage. Creative stakeholders such as Droog Design, MoMA New York, The Netherlands Berlage Institute, and the 2014 Venice Biennale International Architecture Exhibition will present novel approaches on the themes urbanization and borders.